When damaged cold-formed steel members or connections are identified, it is imperative they are assessed to determine the extent of the compromise to the structural integrity and the load carrying ability. Often, such assessment has to be made quickly to contain the propagation of damage to adjacent members and to protect the public welfare. Replacement of material is always an option. However, it may not be the most economical or expeditious solution. Roger LaBoube, Ph.D, P.E., provides a summary on how to assess cold-formed steel members and connections when damaged. 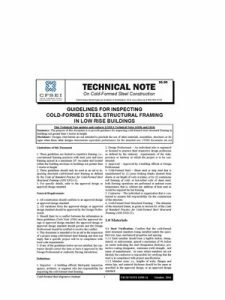 For guidance on proper inspection considerations, the reader is encouraged to review the Cold-Formed Steel Engineers Institute’s (CFSEI) TN G500 Guidelines for Inspecting Cold-Formed Steel Structural Framing in Low-Rise Buildings.